France, perhaps Paris, ca. 1475. 207 leaves (1 column, 16 lines), bound : vellum, ill. ; 183 x 124 mm. Old library label with shelfmark A. III. 76 inside front cover; E. Clark Stillman Collection. 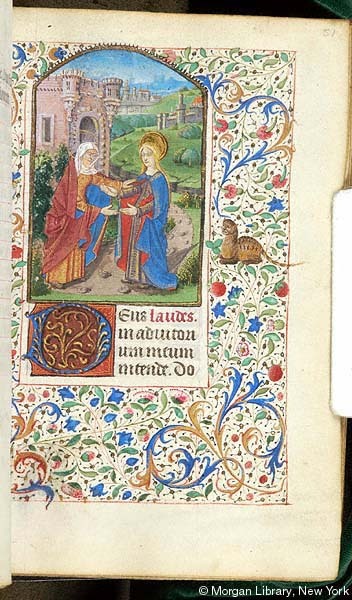 Ms. book of hours, use of Rome (Hours of the Virgin, Office of the Dead); written and illuminated in France, perhaps Paris, ca. 1475. Decoration: 17 half-page miniatures with full borders, 15 small miniatures, 1 historiated initial, 24 calendar illustrations (labors of the month, signs of the zodiac), delicately worked small illuminated initials with foliate and animal motifs, and line-fillers; 1 19th-century decorated title page. The manuscript has been "restored" by a 19th-century artist/owner: in various places excised areas of border have been replaced by what looks like pieces cut from another manuscript, many of the miniatures have been retouched or extensively repainted. Folio 1 is an added decorated title page in imitation medieval style, with colored initials and floral/foliate border.